Posted on Fri, Jan 13, 2012 : 5:56 a.m. Forecasters called for snow overnight Thursday, and they were right: Many in the Ann Arbor area woke up Friday morning to a ground covering. What's unclear so far is whether the snow total will end up reaching the 4 inches forecast as possible outcome from the snowfall. The snow was expected to result in about 1-2 inches by today's rush hour commute. It then should continue during the day for additional accumulation of about 2 inches. Washtenaw County Road Commission trucks were scheduled to salt highways. And, just in case the sight of snow gets the kids excited about a potential day off, no school closings have been reported in Washtenaw County. Meanwhile, it's also a lot colder than we're used to after the recent balmy weather: The morning temperature was 19 and the high will reach 27. The snow is affecting much of the state. According to the Associated Press, the National Weather Service says winter storm warnings were in effect Friday for much of the western Lower Peninsula along Lake Michigan and the northwestern Upper Peninsula along Lake Superior. AnnArbor.com will be keeping an eye on the weather today. See our weather page for a full forecast. Fri, Jan 13, 2012 : 7:45 p.m. Ya' know. I noticed that. Fri, Jan 13, 2012 : 4 p.m.
Fri, Jan 13, 2012 : 2:09 p.m. SO, what's the big deal with the snow? It's winter in MI. Get over it. Fri, Jan 13, 2012 : 7:14 p.m.
Fri, Jan 13, 2012 : 1:18 p.m.
&quot;Washtenaw County Road Commission trucks were scheduled to salt highways.&quot; But as of 8:15 am, it looks like they forgot to do it. 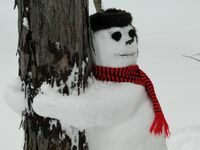 Love the snowman photo--kudos to whoever made it and thanks for the photograph! Fri, Jan 13, 2012 : 7:13 p.m. I like it, too! It's from a previous year, but I thought it made the snow look like fun - and full of possibilities, if we get a few more inches.